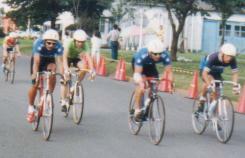 We raced at a nearby army base, Camp Zama, in an "open" race (it was open to the general public). Miimii came along to take pictures, and fight with Craig's girlfriend. They always fought, and during my race, she took my camera from Miimii, unknown to me...I think I would've had something to say about that. Miimii didn't like Craig...she called him "Snake". 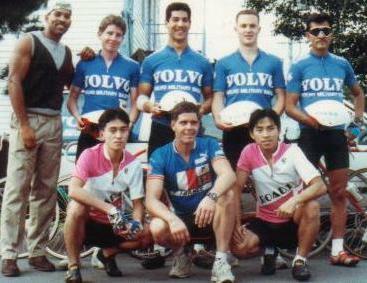 The previous week, J.T., Craig and myself drove to Camp Zama and rode the course all day in the rain. We met Keith V. Orme, an E-6 in the Army. He became a problem for our team, because he was very strong. 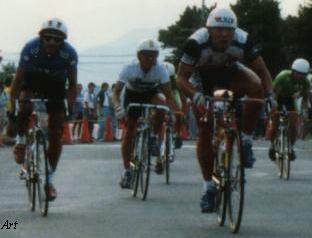 There were two races that day, a 24 kilometer opener which Craig and our new guy, Joe Zamora raced, and a 36 kilometer race which J.T., Art, and myself did. This was an eye-opener...the competition was strong, the course, hilly and technical, and there were about 160 riders in each race, making bicycle handling skills a must. In the 24K race, Craig finished an impressive 10th place (36m 21s). Joe was 37th (38m 35s). In the 36K race, I fell behind while Art and J.T. rode together (first photo...J.T. has the arm-bandage-he crashed on his warm up!). 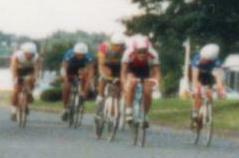 I'd never raced in a pack before, uncomfortable in close-quarters as the other team members were, and it was the first time I'd raced with my new red Klein Quantum bicycle. The deraillers were not adjusted, so the bicycle kept upshifting on the climbs, costing me valuable time at the place where I should have been attacking. As the race went on, J.T. weakened and I passed him (second photo). Overall, we had a respectable showing, with Art taking 15th (59m 30s) coming in first in the military category, me getting 36th (1hr 1min 51sec) and third in the same category, and J.T. coming in at 48th place (1hr 3min 1sec) considering we'd just started racing, and my back brake had been rubbing during the entire race. So we did another team photo, and this time, we invited Spence, our "coach" (the only black guy in the picture) and Keith Orme and his two Japanese friends to pose with us. I had started doing runs that year too. I did a 5K run on September 17th, getting third (17m 40 s) behind Don Funk (17m 24s)and Clark Hamilton (15m 59s!!! 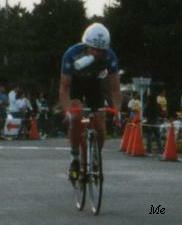 ), one on October 29th, getting second (17m) behind another gazelle, Herman Saul (16m 42s) and then this one... 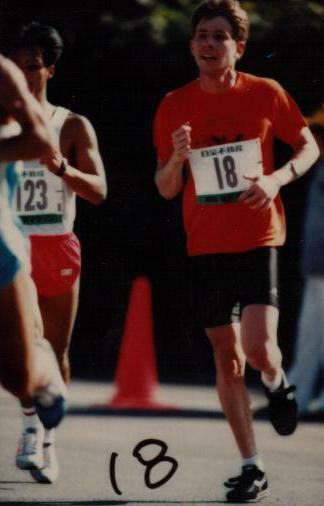 The Yokohama 20K marathon, on November 13, 1988. Art Robledo had told me about it. The registration was closed out but his friend, Ron Faulkner, had signed up and found he could not attend. So I took on the identity of Ron Faulkner for a day. This was the first time I'd raced more than 5K so I had no idea what to expect (I might have exploded in flames at 7K). The day before, JT wanted to do a very hard 70 mile bicycle ride through the Japanese Alps, up the Okutama Toll road and through a mountain pass...some beautiful terrain. So I went because I was bored. It was a blast. This was before I wore running shoes. 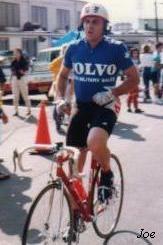 I'm wearing my $14 velcro shoes, my "Headers for Humphrey" T-shirt from my 300 mile ride the year before, and bicycle shorts which Volvo provided. Cologne provided by Aramis. I finished an undistinguished 183rd out of 3083 runners (top 6%)with a time of 1:17:47. It hurt. Two weeks later I finished the year with another 5K run, finishing 4th (16m 51s) behind Clark Hamilton AGAIN, and an unknown Japanese runner, and some other unknown guy. Where were they coming from??? I had running shoes this time.